Schlock auteur Andy Milligan is primarily known for his low-rent horror flicks like Bloodthirsty Butchers (1970), Torture Dungeon (1970) and the fantastically named The Rats Are Coming! The Werewolves Are Here! (1972). However, the fourth edition of the Film-Makers’ Cooperative Catalogue published in 1967 includes an entry for Milligan’s 30-minute short film Vapors. The catalogue says the film was made in 1966, was shot on 16mm and was rentable for 40 bucks. 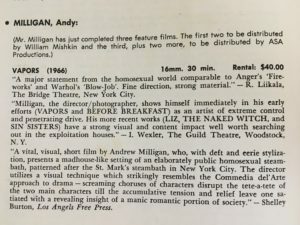 There’s no official description of the film written by Milligan, but the entry includes three reviews that give a good idea of what the film is about and that give excessive compliments to Milligan. Vapors is no longer listed on the Cooperative’s website. You can watch it below; and it was included with Something Weird’s DVD release of the film The Body Beneath. “Milligan, the director/photographer, shows himself immediately in his early efforts (VAPORS and BEFORE BREAKFAST) as an artist of extreme control and penetrating drive. His more recent works (LIZ, THE NAKED WITCH, and SIN SISTERS) have a strong visual and content impact well worth searching out in the exploitation houses.” — I. Wexler, The Guild Theatre, Woodstock, N.Y.